Don't be fooled by the cartoon of a cute bee on the album cover of this release, that bee is hiding a nasty sting and you can be guaranteed it's going to get you. 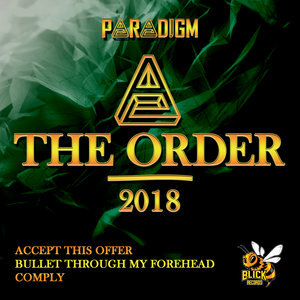 Paradigm is the nutter responsible for this dark and dirty piece of music, an EP that kicks off with 'Accept This Order', the eerie synths on the introduction leading into a dystopic explosion of forward-moving bass energy. 'Bullet Through My Forehead' is more dynamic bass work, a combination of muddy low notes and soaring high notes arranged to perfection. 'Comply' finishes things up in style, initial low frequency pulses leading in a fluttering, feathered melody of bass force. Another big EP.